Over the past five years, many operators and service providers have been trialing 400G technologies on their live networks. In this article, we summarize findings from the review of over 80 trials throughout the world. The review focuses on operators, system vendors, technology options and reach achieved. Internet traffic continues to approximately double every year driven by innovative digital applications, video streaming and other online activities. Such historical data rate demands detected that the industry develop 400Gb/s systems and beyond for current and future bandwidth requirements. 100G coherent systems, which came across as an overkill when engineers first initiated their R&D, are now becoming widely deployed. Although many operators will upgrade their capacity by adding 100G DWDM channels to their networks, eventually it will cost less per bit deploying 400G compared to 4x100Gb/s DWDM, for example. Evidence of the relevance of 400G is already starting to show as suppliers like CIENA are already shipping gear to some customers. According to Cignal AI’s forecast, both 100G and 400G coherent systems will be widely deployed at the edge of the network by the end of 2021. By addressing 400G we are in no way suggesting that every network will have to migrate to 400G anytime soon. 10G DWDM systems will remain relevant in some networks for many years to come. In some emerging markets, operators are only just starting to migrate from SDH systems to 10G DWDM systems. Others are planning to migrate from 10G to 100G which is expected to be more widely deployed over the years. Some will opt to use 100G and/or 400G in high traffic links and maintain 10G systems elsewhere. Some service providers who were expected to be early adopters of 400G are opting instead to migrate to 200G first. What is important is for network planners and designers to be cognizant of network trends and the challenges of deploying higher data rate systems on existing infrastructure. Since fiber optic infrastructure is intended to last for decades, it is important that designers of network infrastructure intended of 10G or 100G today, design with upgradeability requirements in mind. If history is anything to go by, it is highly unlikely that infrastructure installed today for 10G or 100G will be used for the same data rates 20 to 30 years from now. In all deployed coherent 100G systems, polarization division multiplexed-quadrature phase shift keying (PDM-QPSK) modulation is used to improve the system spectral efficiency. Without a change in modulation format from 10G to 100G, 16x100Gb/s DWDM channels would consume the same spectrum as 160x10Gb/s DWDM channels, thereby defeating the whole purpose of migrating to higher data rates. By using QPSK in 100G systems over NRZ-OOK used in 10G systems, the spectral efficiency is improved form 0.2 bit/s/Hz to 2 bit/s/Hz over 50GHz DWDM spacing. In migrating from 100G to 400G, spectral efficiency should also be improved. Quadrature amplitude modulation QAM in the form 2n-QAM, where n > 2 is the constellation order, is one option that is being used. Thus, modulation formats of 8-QAM, 16-QAM, 32-QAM… are being used in 400G and other transmission rates beyond 100G. Unfortunately, these modulation schemes require more system optical signal to noise ratio (OSNR) and have a profound impact on the system reach because they are more prone to laser phase noise and fiber optic non-linearities. For example, a single carrier 16-QAM 400Gb/s signal over standard G.652 fiber with EDFAs and no Raman amplification could be limited in reach to only 200km. This does not meet the requirements for metro networks, let alone long-haul and ultra-long-haul networks. For a more detailed analysis, review the OIF article – Technology Options for 400G Implementation. To improve OSNR and reach, a combination of several approaches is used. This includes the use of ultra-low loss fiber, Raman amplification and superchannels. In a superchannel, several optical carriers are combined to achieve a composite signal of the desired data rate. For example, 2x200Gb/s signals are combined to achieve 400Gb/s. For ultra-long reach, 4x100Gb/s signals are combined and PDM-QPSK modulation is used. Superchannels differ from DWDM signals because to the user, a superchannel is not distinguishable from a single carrier of the same data rate. What progress has been made towards the widespread deployment of 400G and other higher data rate systems? Considering the spectral efficiency – reach (OSNR) trade-off in 400G, what modulation schemes are being used? 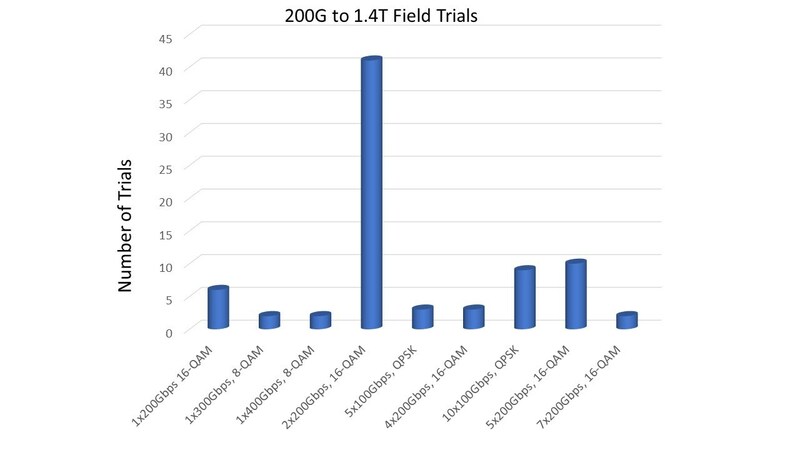 Whose vendor equipment is mostly being used in the 400G trials? Which operators are trialing 400G? Our review has demonstrated that 400G technology is now well developed and ready for widespread deployment by those who require it. In addition to 400G, 150G, 200G, 300G, 500G, 800G, 1T, 1.4T and 1.5T have also been successfully trialed. In most 400G implementations, superchannels and several modulation formats are being used. 2×200 Gb/s using 16-QAM modulation is mostly used for links and data center interconnects less than 500km in reach while 4x100Gb/s with QPSK modulation is used for longer reach. Similarly, 1T is implemented using 5x200Gb/s or 10x100Gb/s carriers. Most leading vendors have partnered with one or more operators or service providers to successfully trial 400G or other higher data rates. Adva, Alcatel Lucent, CIENA, Coriant, Huawei and Infinera are some of the leading 400G system vendors. All leading telecommunication operators, data center operators and IXPs throughout the world have trialed 400G and/or other higher data rate systems beyond 100G. The list of trials is provided in the table below. Most technical concepts mentioned in this article are discussed in detail in the CONA and CONE optical networking classes.